Article by AlexioBash published on his website about ArchLinux in italian. Let’s see now every single row of this output to explain all the information found within the screen. average load on the system (load average: 0.02, 0.12, 0.07) the 3 values refer to the last minute, five minutes and 15 minutes. Now that we have seen in detail all the information that the command “top” returns, it will be easier to understand the reason of excessive load and/or the slowing of the system. A good alternative to “ TOP ” is “ HTOP “, an evolution of top with features really amazing. I use top, but more often use htop, which is like top on steriods. It’s likely in most repos for any distro. OK, so you say what each line “means”, but at that level, the information is pretty much there for the reading in the labels… or the top manpage, anyway. OK, we have “Load”. I know what average means and I /think/ I know what load means, and it goes up as the system gets busier, and down as the system is less busy, but what does “0.02” (the load 1 minute average in the example above) actually MEAN? It OBVIOUSLY can’t be percent CPU load, because that’s reported too, and it’s WAYY too low for that! I KNOW it’s load average, because I can READ the labels. And it’s easy enough to find that the three numbers are 1/5/15 minute averages. What I did NOT know was what load average was. FWIW, if I understand correctly but not getting /too/ technical. “load”, on Linux/Unix, refers the the number of threads that would be ready to run if given CPU time at that instant, as opposed to those that couldn’t run, because they’re waiting for some event. For instance, as I type this, firefox is spending a lot of time waiting for me to type the next letter in the textbox, so it’s mostly idle and not runnable, thus not contributing to load very much. The instantaneous load can be seen on top’s task line as “running” (note that at the moment the measurement is taken, top itself is running, so top should always report at least one running, more if anything else is running at that instant as well, also note that “running” actually means “runnable”, it’s quite possible to have a “running” load well above the actual number of CPU cores available on your system, so it’s NOT reporting actually RUNNING, but “runnable”, despite the label). For those who like a file interface, it’s also available as the “procs_running” line near the bottom of /proc/stats. Also see /proc/loadavg for the averages, a runnable/total threads ratio as the 4th number, and I don’t know what the 5th is. “Load average” indicates how many threads were runnable on average during the time in question, and a one-minute load average of 1.00, under ideal conditions, would mean that exactly one cpu core was running at 100% during the last full minute, which on a single-core system would be 100% CPU utilization (ideally). Of course in actuality, a 1.00 one minute load average isn’t likely to keep a single CPU core at 100% usage for the full minute, because for a small fraction of that minute there was likely a 2.0 instantaneous load as the average was updated and as other system tasks did their thing, which means there was also a fraction of time when nothing was ready to run and that core was idle. 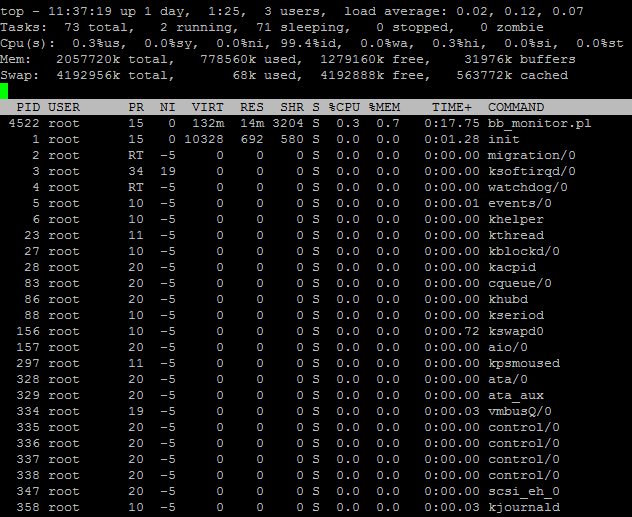 So to get close to 100% CPU utilization on a single core in practice takes a bit more, say a 1.5 load average. Thank you for making this article actually worth reading. I was very frustrated in the uselessness of it until I got to your comment. Useful article, helping diagnose server load problems. Using with atop is much recommended. Big help with figuring out what the linux ‘top’ column headers all meant. Thank you! !